Now that we know a little more about what free radicals are and their key properties, the question for today is, “how does this reaction work?“. We’re going to go through the key steps of this reaction and learn that they are composed of three key phases: initiation, termination, and propagation. Every free radical reaction begins with a step where free radicals are created, and for that reason this initial step is called initiation. Note that there is a net increase of free radicals in this reaction. We’re going from zero (in the reactants) to two (in the products). If you count the number of free radicals in this equation, you’ll note that there’s one in the reactants and one in the products. So there is no net increase in the number of free radicals. This type of step is referred to as “propagation”. If you’re keeping score, by this point you should be able to see that there’s only one bond left to form before our reaction is complete. We need to form a C–Cl bond. It’s here where it’s easy to make a little mistake. Seeing that there’s two chlorine radicals formed in the initiation step, it would seem natural to bring together the methyl radical and the chlorine radical to form CH3–Cl . Right????? Note the number of free radicals has decreased here, not stayed the same. It can’t be propagation! In fact, we can do the proper “propagation” step this way: Take the methyl radical, and it reacts with the Cl2 still present. This gives us CH3Cl and the chlorine radical. Note that there has been no net change in the number of free radicals, so this is still a “propagation”. Note again that we are forming a chlorine radical! What’s so crucial about this? 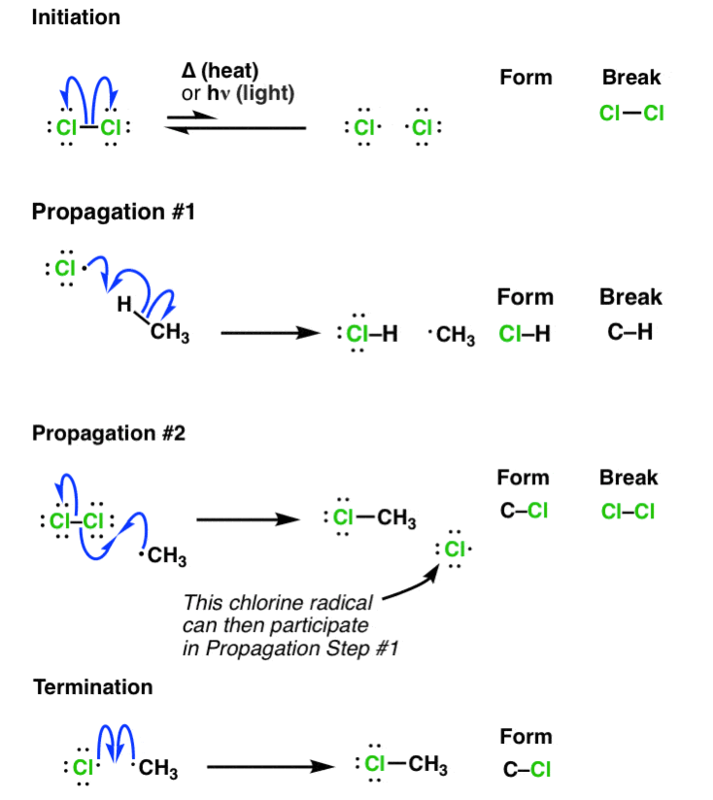 It’s crucial because this chlorine radical can then perform Propagation Step #1 on a new molecule of our substrate (CH4), continuing the process. It’s a chain reaction – once generated, chlorine radical is catalytic. That’s why we only need a small amount of chlorine radical for this reaction to proceed. Can this chain reaction go on forever? No. Let’s think about two limiting cases. If the concentration of Cl2 is low relative to CH4 (in other words, Cl2 is our limiting reagent) then the rate of Propagation Step #2 will slow down as its concentration decreases. Without any Cl2 to react with, our •CH3 radicals can just combine with another free radical (such as •Cl) to give CH3Cl, for example. There is essentially no barrier to this reaction. Note that here the number of free radicals decreases from 2 to zero. This is called termination. It’s also possible for two methyl groups to combine together to give CH3–CH3 ; this is also termination! Let’s put all of these steps together so we can clearly see the initiation, propagation, and termination steps. These three types of steps are encountered in every free-radical reaction. The bottom line here is that by counting the number of radicals created or destroyed in each step, you can determine if the step is initiation, propagation, or termination. We’ll leave with two teasers for future posts. First… note that here we’re using CH4, where every C–H bond is identical. What might happen if we used an alkane where all the C–H bonds aren’t equal… like propane, or pentane, for example? Secondly, this reaction fails spectacularly when Br2 is used instead of Cl2 for the reaction of CH4. However, we’ll see that Br2 can work in certain special cases. We just talked about the situation where one equivalent of chlorine (Cl2) is used. What happens when we use multiple equivalents, or even a vast excess? Think about it for a second. Imagine we had multiple equivalents of Cl2 in the presence of CH3Cl. What do you think might happen? An atom of Cl• could react with CH3Cl to give •CH2Cl [and HCl], which could then react with Cl2 to give CH2Cl2 ! Likewise, if we still have an excess of Cl2, then we will observe conversion of CH2Cl2 to CHCl3. Finally, given enough Cl2 we could then imagine the conversion of CHCl3 to give CCl4. At this point there are no further C-H bonds to react with the chlorine radical, and thus our reaction would eventually terminate. The bottom line here is that alkanes, given a large enough excess of Cl2, will eventually have all of their hydrogens replaced with chlorine. This pathway is in fact how dichloromethane (CH2Cl2 – a common laboratory solvent) chloroform (CHCl3) and carbon tetrachloride (CCl4) are produced industrially. For many decades, CCl4 was produced on mega-ton scale for use as a refrigerant and dry cleaning solvent until studies implicated it and other CFC’s in depletion of the ozone layer. Free Radical Initiation: Why Is “Light” Or “Heat” Required? tanks for your information, it’s really useful. When methane react with chlorine, the products vary with the amount of chlorine in the mixture. So when equal amount of chlorine and methane are used, what happens? please help me out! First, why bromine mostly fails to do these steps? Is it because bromine’s nature? Second, what if we reacted propene instead of methane? where will the position of chlorine be? I talk about bromine in this post. Basically the thermodynamics are less favourable because of the weaker H-Br bond being formed. Propene would react with Cl2 to give the vicinal dichloride (chlorination), not through the radical pathway. In the formation of dichloromethane if an atom of Cl radical interacted with CH3Cl in the first propagation step how do you still have Cl2 in the second step? Wouldn’t you just have one Cl radical left? Hey is there possible for any two free radical chlorine to combine back as termination? Yes! Although the concentration of Cl• at any given time is very low, so it tends to be slow until the concentration of the species participating in propagation is depleted. Hello! Thanks for all the info, the website is really great. I have one question if I may. Why in the first place does the Cl* radical “take” the hydrogen from, for example, the methane? Is the H-C bond in methane weaker than the Cl-C bond? Or should I ask if the Cl* radical least stable than the H3C* radical? Which one is the right question? And are there other basic thing to take into account? The way to look at it is to compare bond enthalpies and calculate the difference in energy going from starting material to product. The bond strength of H-Cl is about 106-107 kcal/mol whereas the bond strength of H-CH3 is about 104 kcal/mol. Therefore the “gain” in energy is about 3kcal/mol from the chlorination of methane. (The C-Cl bond does not factor into this reaction, except as a possible termination step). That at least gives you an idea of whether or not the process will be energetically favorable overall. We don’t cover free-radical fluorination because the H-F bond is even stronger than C-H, and furthermore the reaction is so exothermic that combustion tends to take place. On the other hand free-radical iodination generally fails because H-I bonds are so weak, relative to C-H . So, in summary: bond strengths are a good guide.